Up on the moors on the edge of the Forest of Bowland is a large, box-shaped, chunk of rock. It sits just inside North Yorkshire on the border with Lancashire. With characteristic English wit and imagination, it is known as the Big Stone, or the Great Stone of Fourstones – because apparently there used to be three more, presumably smaller, stones which have long since vanished. Heading south, you can reach the Great Stone by selecting low gear out of the town of High Bentham along the intriguingly named Thickrash Brow; it suggests an agricultural disease that affects the forehead, possibly in circumstances of too few surnames. Cross the cattle grid and you’ll see the Great Stone of Fourstones away to the west, at the end of a, normally rather soggy, path. There’s a small pull-in for vehicles. Other routes are available; you can come at it heading north from Slaidburn across the bleak moors of Bowland – not an enjoyable drive when the weather’s dodgy. The stone is about 18 feet (5.5 metres) high and used to be a boundary marker between the two counties. Some believe it was a meeting place in ancient times. It’s a breezy location – you can’t help thinking that there must have been cosier spots where tribal chiefs and what-not could have got together for a natter and a catch-up. Perhaps they liked looking at the smashing view of Yorkshire’s three peaks, Whernside, Ingleborough and Pen-y-Ghent, away to the north east – or perhaps they preferred to keep their meetings brief and to the point. Suggest this idea to your Parish Council, or Member of Parliament; it puts a whole different perspective on the origins of ‘long-winded’. Some distantly departed person has carved 14 steps in the side of the Great Stone so you can clamber to the top. It has also, probably inevitably, been subject to those who are inclined to leave graffiti in their search for immortality. Don’t be too harsh; some of us start websites. 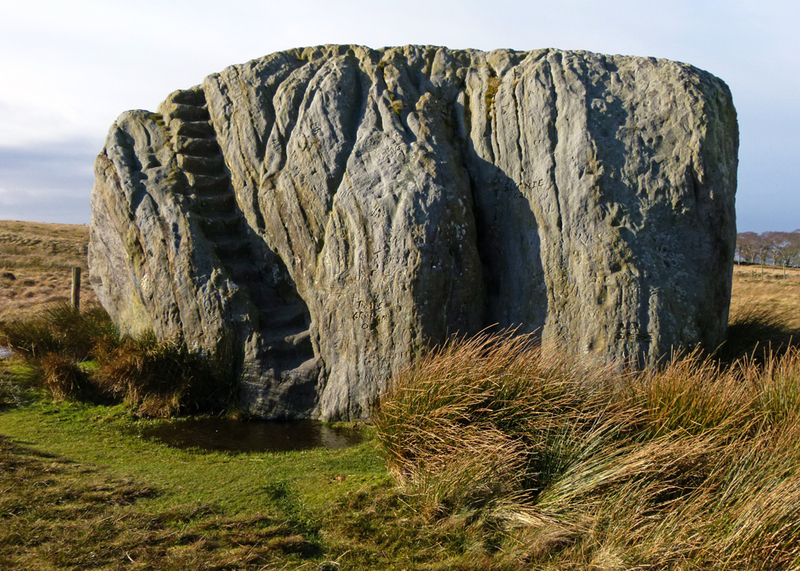 Geographers will recognise the Great Stone of Fourstones as a glacial erratic – a piece of stone transported from far away by a glacier and left behind when the ice retreated 10,000 or more years ago. During the course of its journey it has been tumbled, or maybe it was pushed by earth’s great forces before breaking off and enduring its icy piggy-back: I don’t know; anyway, the strata in the rock are about 90 degrees off horizontal. The above explanation is, of course, complete tosh. Everybody knows that the Devil dropped the stone on his way to build the Devil’s Bridge at Kirkby Lonsdale about 11 miles away – though I suppose it’s also possible that it was thrown across the Irish Sea by the giant Finn McCool (who built the Giant’s Causeway in County Antrim). Such a lovely part of the UK. I’d not heard of these stones so many thanks for a very interesting post. What an unusual stone. I had never heard of it before. What a lot of work it must have been to cut those steps, I cant imagine thinking I would even start something like that! This is a fascinating geological curiosity. I am fortunate enough to live just 10 minutes away from the big stone and have been many times accompanied by my dog. Fantastic views and you’ll be surprised just how big it is. Please be aware that it is in a nature conservation area and dogs need to be on a lead because of ground nesting birds. Beautiful place but can be wild, wet and windy so make sure you have good waterproof footwear! Well worth a visit. Hi – thanks for dropping in – and a good point about dogs and birds; much appreciated. Thanks Mike – another one for the ever-expanding must-visit list! Had vaguely heard of it before but your excellent article has brought it into focus. Will definitely visit now! Another one of those rather remote places that I’d love to visit when in Yorkshire but probably never will without a car. But I can always look at it here on your blog! Definitely a new one on me, never heard of it before. I love this great stone but then, I would, having grown up in the shadow of Stone Mountain all our rock formations in this area! Now, under exactly what circumstances do you suppose that someone set about the arduous and time-consuming task of cutting steps all the way up to the top? Just wondered. What a beautiful landscape there! Wow! This is huge and it looks to be in the middle of nowhere! Very cool…thanks for sharing!